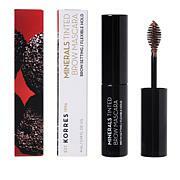 This lightweight brow mascara formula tints and defines brows to create a fuller look and an overall illusion of thickness. Brows are set, for naturally framed eyes all day long. 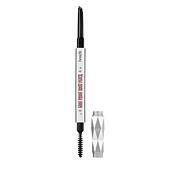 Apply Brow Mascara to eyebrows in the direction of hair growth in quick strokes to build and define eyebrow hairs. For a bold, intense brow look, use a brow pencil to fill in any spots and then follow with the Brow Mascara, brushing brows in the opposite direction of hair growth to deposit color and add texture. Follow by combing brows in an upward and outward motion, in the direction of hair growth, to create your desired brow shape. KORRES BROW MASCARA LIGHT .14 fl. oz. Ingredients: Aqua/Water/Eau, Butylene Glycol, Nylon-12, Copernicia Cerifera Cera/Copernicia Cerifera (Carnauba) Wax/Cire De Carnauba, Kaolin, Cera Alba/Beeswax/Cire D'abeille, Methylpropanediol, Butyrospermum Parkii Butter/Butyrospermum Parkii (Shea) Butter, Hydrogenated Rapeseed Oil, Hydroxyethylcellulose, PEG-20 Glyceryl Stearate, Phenoxyethanol, Potassium Sorbate, Dimethicone, Stearic Acid, Sucrose Distearate, Sorbitol, Simethicone, Caprylyl Glycol, Tromethamine, VP/VA Copolymer, Caprylhydroxamic Acid, Glycerin, Steareth-4, Steareth-20, Sorbic Acid, May Contain/Peut Contenir [+/-]: Mica, CI 77891/Titanium Dioxide, CI 77491/Iron Oxides, CI 77492/Iron Oxides, CI 77499/Iron Oxides. I have very sparse brows. I wanted to go with a lighter more natural look than I had been. I received this mascara very quickly and tried it right away. For some reason, the product only stuck to my sparse brow hairs. Those looked nice and natural. However, the product never adhered to the empty skin just the thin and sparse brow hairs. It looked great in the spots with the sparse brow hairs but I remained with the same naked and empty skin, same as before. Sorry. Had to send the product back. Brush deposits too much product in one area have to use another tool to smooth it out. I would have returned it but took it on a trip. I had good faith in it that I tossed the box, receipt. I was hoping this would be great at making eyebrows appear thicker. I applied several coats without luck - could not even see it on brows. The medium was way to light also for brown eyebrows, really would have needed the deepest shade to maybe see it but that was encouraged for people with darker skin and hair tone. Will not buy again. I received this product all dried up and not much of the product in the tube, so is going back to hsn.